Designed for Entertaining! Resort-Like Backyd. 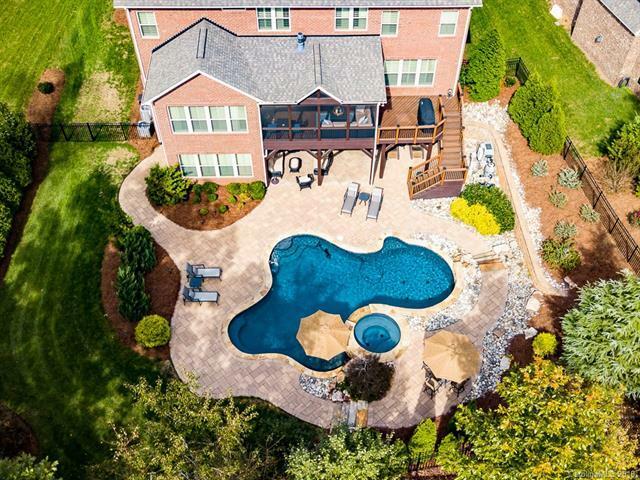 In-ground Heated Gunite Pool & Spa- Fully Finished Basemnt. Over $360K in Upgrades & Improvements!! Abundant outdoor living -Trex screened-in back porch & deck overlooks the beautifully designed pool surrounded by stone paver terrace. Plenty of seating space under the covered porch. Custom landscaped backyd, fully fen'd & private. Beautifully appointed, excellent condition! Rocking chair front porch w/ lovely view of the treed amenity area. Open foyer, formal DR, GR with coffered ceiling and marble surround gas fp. Gourmet kit w/ granite island, breakfast area w/stunning "wall of windows overlking pool/bckyd. Spacious first flr Master BR, Master BA split vanity, garden tub, tiled shower surr. 2nd flr w/ 4 BR, 3 full BA, Bonus Rm plus Off. Finished walk-out basement features huge rec area w/bar, Master sized BR + full BA plus access to Pool/Cov'd porch. Storage/exercise area. Surr sound, upgraded lighting & plantation shutters+ more! !